In the Crossfire: Is defunding Obamacare worth it? The U.S. House of Representatives has launched the latest spending battle with the passage of a spending plan that could lead to a government shutdown and would eliminate all funding for Obamacare, the controversial health care reform law passed in 2010. House Speaker John Boehner (R-OH), citing the law's unpopularity, said: "The American people don't want the government shut down and they don't want Obamacare. The House has listened to the American people. Now it's time for the United States Senate to listen to them as well." "I will not negotiate over the full faith and credit of the United States," President Obama shot back at a speech in Liberty, Missouri. 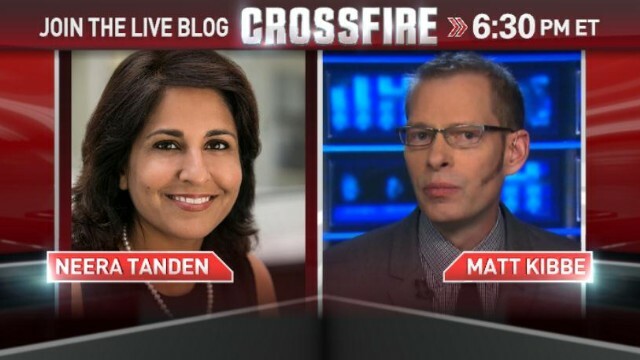 Joining hosts Newt Gingrich and Stephanie Cutter in the Crossfire are Neera Tanden, the President of the Center for American Progress and a key architect of Obamacare, and FreedomWorks President and CEO Matt Kibbe, who supports defunding Obamacare. We want you to weigh in. If the government shuts down, which party deserves the blame? Vote on our daily question below or Tweet your response using #CrossfireReturns. "Let me get this straight. We've been "gifted" with a health care plan that we're forced to purchase and "taxed" if we don't, written by a committee whose chairman says he doesn't understand it, declared deficit neutral by a CBO that only underestimated SS and medicare costs by about 100 trillion dollars, give or take a few trillion, passed by a Congress that hasn't read it but exempts themselves from it, gaveled into law by a Speaker who states we have to pass the damnbill to find out what's in it, signed into law by a President who smokes, supported by a first diet guru with a rearend the size of a battleship beam, exclaimed to be a big friggindeal by a sleepy VP with Attention Deficit Disorder and a really bad plug job, considered to be such a great plan by the unions that hundreds of them supported it, then promptly applied for and were granted exemptions from it, enforced by an Attorney General with a terrible case of amnesia, policed by 16,000 new IRS agents who are "here to help you", with funding administered by a Treasury Secretary who "forgot" to pay his taxes, overseen by a Surgeon General who's obese, and financed by a country that's broke. What could possibly go wrong?" Who are all these people saying the "public doesn't want Obamacare?" Do they have insurance? If so, they can keep it. Do they not have insurance? Well, now they'll get some. Who did they think was going to pay for their ER visit anyhow? Me? ACA passed in 2010 – a bipartisan legislation passed by the house and senate. Since that time the House Republicans have attempted to repeal it 41 times. They have been dead-set on ending it before it begins in 2014 – and have wasted so much time in session even while knowing that the Senate will not defund Obamacare, and even if they did, the President will veto any legislation. It truly is incredibly costly each time they do this. including multiple times using the World and US economy as pawn pieces to try and stop the health care regulation that will come with the program. During the Bush administration many unpopular pieces of legislation could have been held hostage, especially since for his final 2 years the House and Senate were Democratic majority. But they still compromised, they still did their jobs. The Republicans in the house are acting like spoiled children who didn't get their way during a ball game, so they hold on to the ball so that no one can play. While they hope Obamacare gets repealed I'm hoping each one of them does! The President was elected on policies clearly delineated. That is the fundamental principle of democratic government. The fundamental principal of a democratic government is that elected officials listen to the will of the AMERICAN PEOPLE! Aston, I'm sorry but you obviously don't listen, read or understand Obamacare (actually, no one knows exactly whats in it). The folks who voted Obama into office clearly were not aware of the stunts he was going to pull after he gained another term. Listen to his speeches and campaign promises? Listen to his lies. I understand that you must feel really bad about the choice you made I would feel the same if I found that I made a gross mistake by trusting someone who betrayed me. But at least open your eyes and realize that this travesty that Obama perpetuates is so damaging to all Americans with the middle class taking the biggest hit, as well as small business and something has to be done to end his foolishness. We are not a socialist republic, the government does not have to take care of everyone. Currently the producers are being punished with the stagnant being rewarded. I'm sorry you cannot see any of this. FYI We are a Constitutional Republic not a Democratic government as you claim. Check your civics books. That is absolutely correct. Part of democracy is learning to live with the results, both the ones you voted for and the ones you didn't. If "the American people" hate Obamacare so much, let them say so themselves by voting Obama out, which they didn't do last year. I'm not a huge fan of ObamaCare but it is the law of the land. We've had not one but two election cycles since its passage and it has remained the law of the land. The republicans are really being childish about this. I hope they experience a big backlash if they shut down the government. Young Entreprenuer, don't think you will using that handle too much longer if Obama's policies are not thwarted. I will share the same reply as I did with your obvious buddy Aston. Listen to his lies. I understand that you must feel really bad about the choice you made, I would feel the same too, if I found that I made a gross mistake by trusting someone who betrayed me. But at least open your eyes and realize that the travesty that Obama perpetuates is so damaging to all Americans with the middle class taking the biggest hit, as well as small business and something has to be done to end his foolishness. We are not a socialist republic, the government does not have to take care of everyone. Currently the producers are being punished with the stagnant being rewarded. I'm sorry you cannot see any of this. OBAMACARE is such a disaster that Max Baucus the author of the bill calls it a train wreck. Democratic Senators are asking Senator Reed to exempt members of the Senate and their staff. The only ones for tis terrible bill is the progressives who want to run everyones lives and exempt the rules for themselves. Scrap the whole program and start over again. If the republicans really thought Obamacare was such a disaster they would not be trying to stop it, as that would help them at election time, they are afraid it will work and make them look like fools. The ACA is a violation of my individual liberty and it's "tax" violates provisions of Article V of the constitution. As for who is threatening to shut down the government, the house has voted to fund all but 1 program. Meanwhile, Obama and Reid have stated that THEY are willing to shut down the government to preserve the ACA. overwhelmingly against it, the unions don't want it, the NFL said no thanks, and it isn't selling in Ohio at the Cleveland Clinic. If the country does not support this Obama Care can you call it a good program to force on the American people? So how do you defend it? By lies, and of course bullying those who recognize it for what it is. Ah yes, the hypocrisy of politicians. A good bill should be determined by all of us! Not the political mayhem of the federal government. History will know the truth. The disgrace will be documented and those of you who do not believe it should wear a very pretty smile. If America did not want ObamaCare and felt that strongly about it, why was President Obama voted back into the White House? Not only voted back in but by a large margin? This is the law of land, deal with it! Republicans need to stop whinning and actually do the job they were voted in to do. If you care so much about America, where are the jobs? Where are the alternatives to ObamaCare? Republicans have had 4 years to present an alternative. The only alternative they have presented is just to be Anti-Obama. Just insane beyond belief.